Introduction: Laparoscopic sleeve gastrectomy (LSG) has recently been recognized by the American Society for Metabolic and Bariatric Surgery as a primary procedure for the surgical management of morbid obesity. Leaking or hemorrhaging at the staple-line are two feared complications associated with this procedure. Bioabsorbable staple-line buttressing materials have been suggested to decrease bleeding and minimize the risk of leakage at the staple-line. In the bariatric literature their use remains controversial. Furthermore, when placed during LSG, few published papers exist that compare the incidence of staple-line leakage or hemorrhage to that of non-reinforced staple-lines. 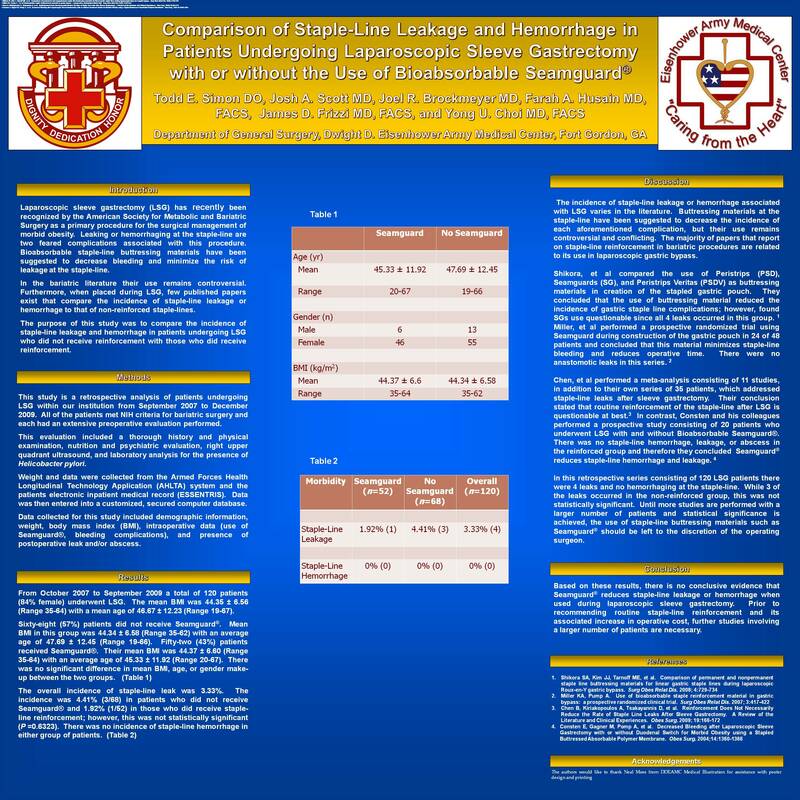 The purpose of this study was to compare the incidence of staple-line leakage and hemorrhage in patients undergoing LSG who did not receive reinforcement with those who did receive reinforcement (Bioabsorbable Seamguard®, W.L. Gore & Associates, Flagstaff, AZ). Methods: This study is a retrospective analysis of patients undergoing laparoscopic sleeve gastrectomy from the initial inception of the procedure at Eisenhower Army Medical Center (October 2007) to September 2009. Data were collected from the Armed Forces Health Longitudinal Technology Application (AHLTA) system and the patients’ electronic inpatient medical record (ESSENTRIS). Results: From October 2007 to September 2009 a total of 120 patients (84% female) underwent LSG. The mean BMI was 44.35 ± 6.56 (Range 35-64) with a mean age of 46.67 ± 12.23 (Range 19-67). 68 (57%) patients did not receive Seamguard®. Mean BMI in this group was 44.34 ± 6.58 (Range 35-62) with an average age of 47.69 ± 12.45 (Range 19-66). 52 (43%) patients received Seamguard®. Their mean BMI was 44.37 ± 6.60 (Range 35-64) with an average age of 45.33 ± 11.92 (Range 20-67). There was no significant difference in mean BMI, age, or gender make-up between the two groups. The overall incidence of staple-line leak was 4.17%. The incidence was 5.88% (4/68) in patients who did not receive Seamguard® and 1.92% (1/52) in those who did receive staple-line reinforcement; however, this was not statistically significant (P =0.3871). There was no incidence of staple-line hemorrhage in either group of patients. Conclusion: Based on our results, there is no conclusive evidence that Seamguard® reduces staple-line leakage or hemorrhage when used during laparoscopic sleeve gastrectomy. Prior to recommending routine staple-line reinforcement and its associated increase in operative cost, further studies involving a larger number of patients are necessary.